I love salsas of all kinds. Traditional red salsa, corn salsas, fruit salsas – it would be hard to nail down just one favorite. Last week we had fish tacos, and I went to the store for a few last minute ingredients. The cashier alerted me to the fact that the fresh, local cantaloupes were on sale for $2 BOGO. How could I resist? A true buy one get one too, not that BOGOHO crap! I’d planned to do my usual mango salsa, but remembered when Shawnda had made a cantaloupe salsa to pair with fish tacos, and thought that would be a fun twist instead. I pretty much just took my recipe for pico de gallo, and subbed in cantaloupe for tomato. It was fresh and delicious, and perfect with the blackened fish. And of course it wonderful for munching on with tortilla chips too. I know this would be a hit at any potluck or BBQ, as it’s so unique and different. Taking advantage of the last of the summer’s bounty while I still can, I know I’ll be making this a few more times before all the good melons are gone! 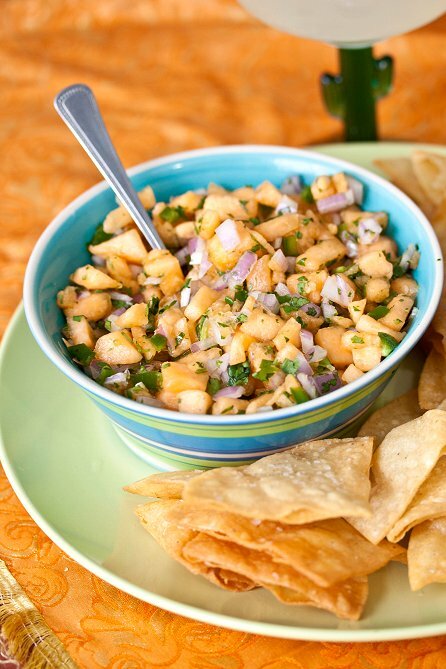 Combine cantaloupe, red onion, jalapenos, cilantro, and lime juice in a medium bowl. Stir to combine. Season to taste with salt. Cover and refrigerate until ready to serve. Oh lovely – this sounds so refreshing!! I have been obsessed with cantaloupe lately (just ate half of one with lunch!)! It’s pretty much the way I’ve been staying hydrated this summer, lol! 😉 I enjoy making salsas with fruit and have not tried cantaloupe salsa yet. Next time I make tacos, I’ll try it out! Found you at the Gooseberry Patch Round-Up. Cantaloupe is my favorite fruit and I love salsa, so I just pinned this one. Sounds delicious and refreshing! I made this for lunch today and I loved it. The family could not stop eating it. This will soon become a staple snack/ light meal in our home. Thank you. Btw, I found you at – http://www.catchingfireflies.com/blog/2012/09/6-sweet-spicy-salsas-to-try/.